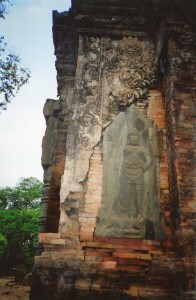 Preah Ko was one of the most influential works of art in Khmer history. We had an introduction to it in Preah Ko, A Jewel of Khmer Architecture, Part One. We’ll now find out what makes it special. 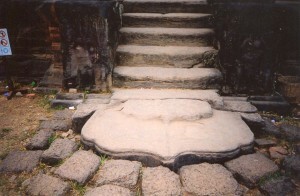 King Indravarman built it in the Khmer capital at Rolous as a temple to his ancestors. It thus has an intimate atmosphere that contrasts with later eye-bulging monuments like Angkor Wat. Preah Ko was the first major temple in Angkor’s area, but it set a standard of elegance for the next 600 years. 1. Two rectangular enclosures of walls and gatehouses surround Preah Ko (they’re poorly preserved). 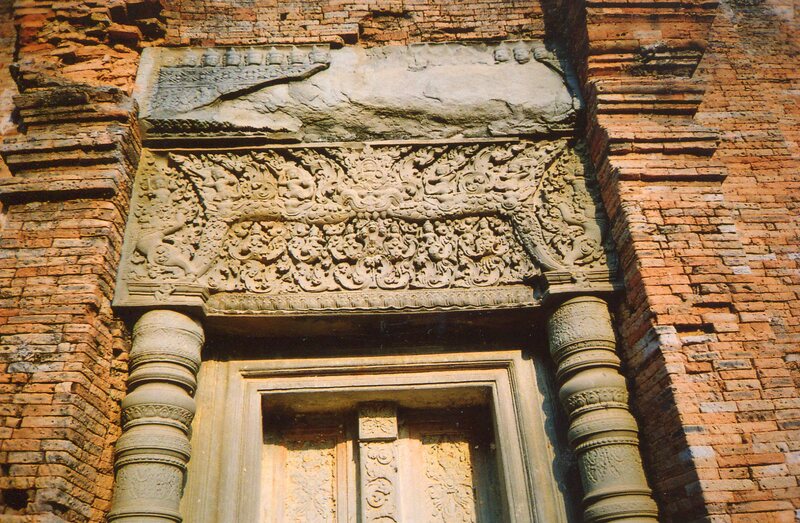 Almost all major Khmer temples would be a system of symmetrical walls. Khmers expanded Chenla symmetry to huge dimensions. Regularity on an enormous scale became a model for directing the growing state. Perhaps people thought sympathetic magic would keep the annual monsoons regular, and the newly increased population obedient as they farmed and labored on the massive public construction projects. Khmer society was largely 2 dimensional. It was ruled by a king, nobles and elite priests. It lacked a Confucian tradition of literature that outlined ethics that all levels of society had to adhere to. Khmer society also lacked the West’s multiplicity of institutions (multiple states, the Church, and later, parliaments). Khmer kings were sacred, and their authority was theoretically absolute. But there were no rules for successions. Contestants for the throne often settled their disputes on the battlefield. The king’s power was absolute over his people, but several guys claiming to be the top dog often fought each other. Society was cemented by personal loyalties between the king and nobles, and dazzling rituals. So displays of sacred power were critical in Khmer society. Kings delivered with hulking monuments like Angkor Wat and flashy cults for imported Hindu gods. But Khmer rulers added style that made their works some of the world’s most beautiful art. 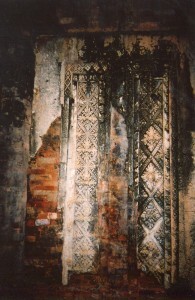 Thus Michael S. Falser noted that Preah Ko’s surrounding walls balance space. They weren’t large enough to dominate the area. They were in harmony with the empty spaces between them. Positive and negative volumes complemented each other. 2. 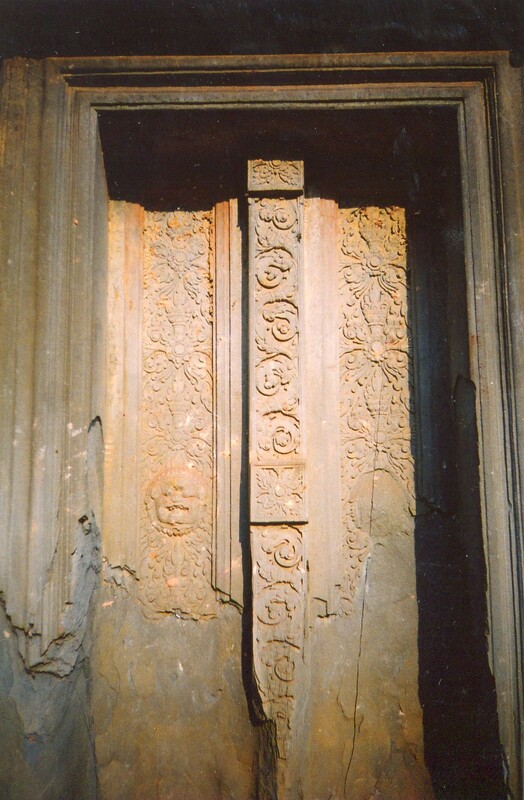 Elegant carvings of warriors guard doorways. Serene and aloof, they embody the power of royal ancestors and Shiva. But they also project aristocratic refinement. 3. 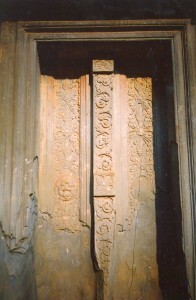 Aristocratic elegance infused many of Preah Ko’s forms, including the false door pictured above. And right down to the bottom step. You know you’re in sacred and regal territory as soon as your foot leaves the ground. These exquisite lines on the bottom step had already been used in the old Chenla capital, Ishanapura. Indravarman also graced the Bakong with them. They remained one of Khmer architecture’s distinctive features. These elegantly flowing lines contrast with the simple straight lines of Greek temples. Clarity, linearity and simplicity have been Western values since the ancient Greeks perfected expressions of them. 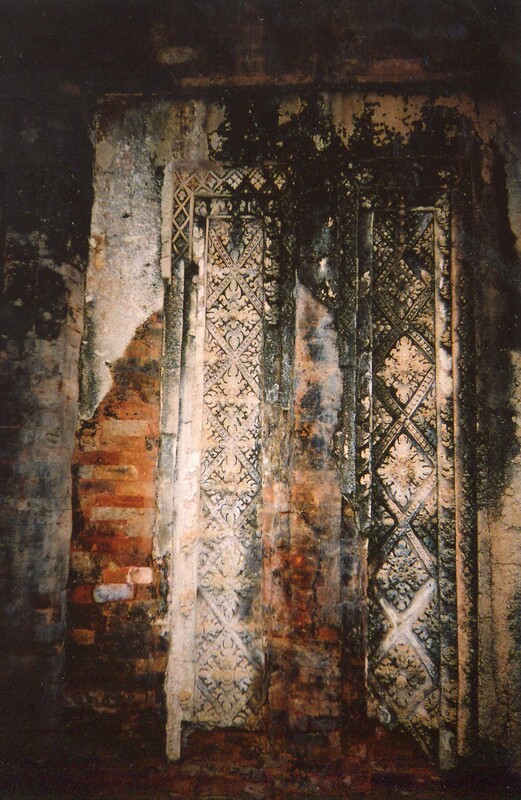 But lines in Khmer temples were made to embody aristocratic elegance and the gods’ power to order the universe and bring the waters that crops grew from. 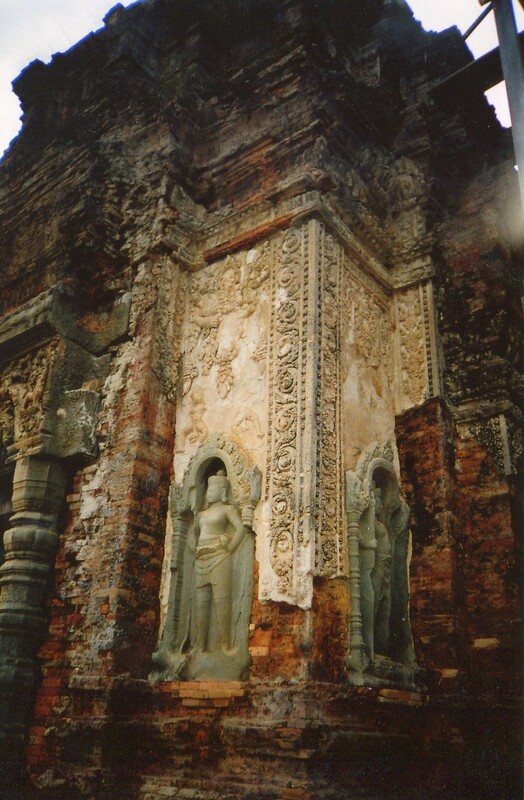 Above, you can see two features that graced almost all Khmer temples, and they’re absolutely stunning. 1. 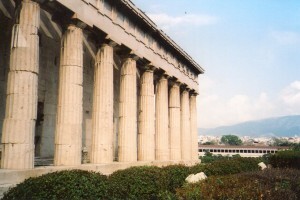 The otherworldly opulence of the columns flanking the doors is the opposite of linear Greek columns. 2. 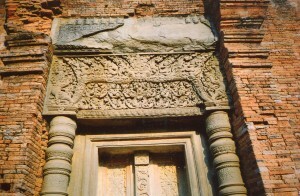 The lintel is decked with a dense floral pattern. Garlands emerge from both sides of the mouth of a monstrous figure called a kala, and beasts called makaras from Indian mythology spring from both ends of the garlands and face outwards. Horsemen emerge from the tops of the garlands, and from nagas (snake-like figures) under the garlands. The design’s density makes it both elegant and animated. It seems to project the powers of the tropical sun and monsoon, and refine them by the grace of the gods and the king. So Preah Ko is full of features that are both elegant and animated. The next 500 years of Khmer art would see many glorious mixtures of these two themes. Sometimes they would be exquisite (at Preah Ko and Banteay Srei), but in later times, the shock and awe theme often took over. 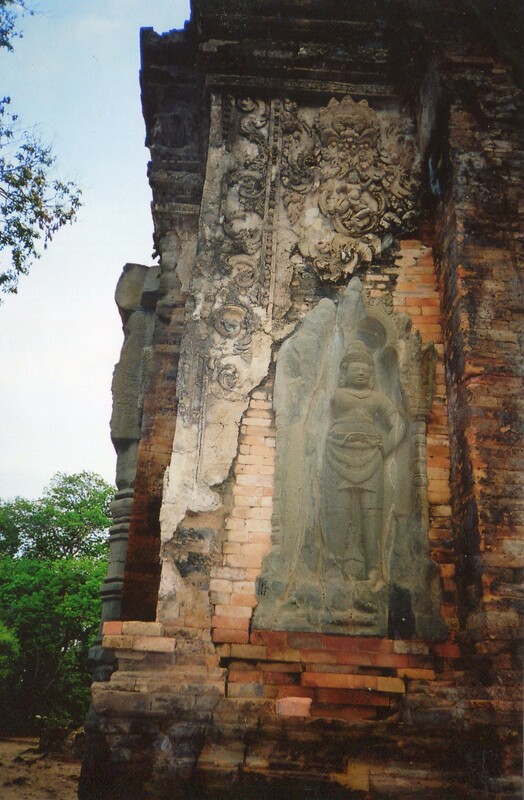 But most Khmer monuments have these two personalities that are in dynamic tension. We can enjoy the immense varieties they came in.